An unclothed woman was walking on the road. What the motorists did was SHOCKING! Home / News / An unclothed woman was walking on the road. What the motorists did was SHOCKING! An unusual sight has captured the attentions of the motorists in the city of Moscow in Western Russia. 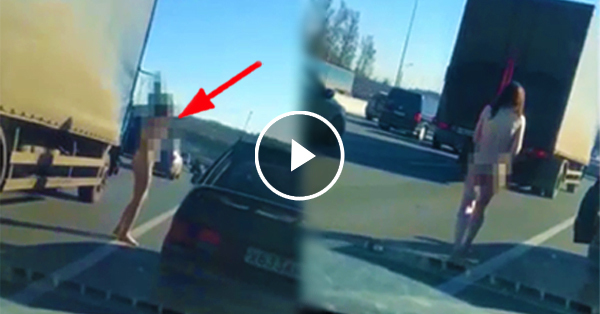 A woman who's completely undressed was seen walking the in the busy high way. She was seen walking between traffics on a main road, during a rush hour. Motorists claim that they've witnessed this how this woman shivered because of the cold weather and how she looked distressed as she walk in between the lanes of the road. This video is now circulating online! As soon as this video went viral, the netizens couldn't help but to post their opinion about it. Some claim that they were saddened to know that there were lots of motorists who saw her undressed in the streets but then none of them offered a single help. Instead, they even filmed and made fun of her using their mobile phones. Meanwhile, one of the drivers who witness this act claim that they wanted to help her but then they're afraid that this woman might be on drugs. There are no official statements yet about why this woman actually walked on the streets shivering and covering her breasts with her hands.